A sense of presence is the theme currently explored at the Elga Wimmer Gallery pop-up group show “Being There.” In the spiritual center of it all is interdisciplinary artist Chrysanne Stathacos’ Rose Mandala (of Three Refections), gently reminding us of the profound impermanence of beauty. YogaCity’s Sharon Watts sat down with the Canadian-American artist of Greek ancestry to hear how she evolved on her path. Sharon Watts: You’ve been a working artist for almost forty years, doing everything from printmaking to portraits on rose petals to participatory public art projects. 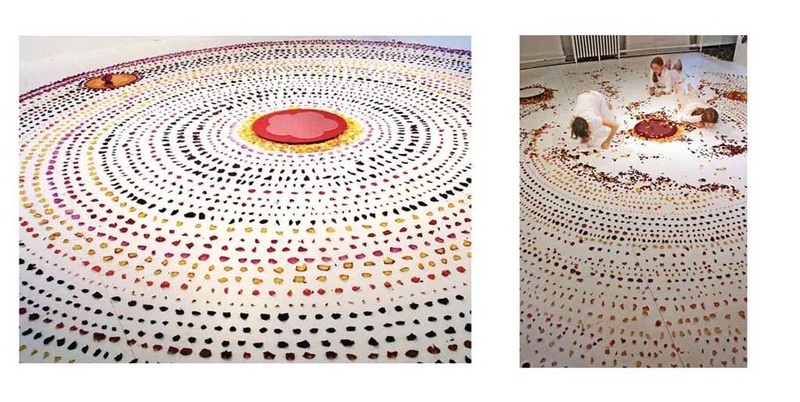 How did the rose petal mandala become part of your creative oeuvre? Chrysanne Stathacos: I have a visual mind, and have always been interested in experiences of a sensory nature. A lot of my work has always been about the feminine. I had already been using roses and natural materials as part of my process–in prints, installations with mirrors, and various iconographies of nature–to evoke a metaphysical/spiritual engagement. I made my first mandala almost fifteen years ago, and subsequently was commissioned to create one for a visit from His Holiness the Dalai Lama for the conference “Law, Buddhism, and Social Change” in 2006. SW: What influences your work more: intellectual thought or spiritual intuition? CS: Both, really, along with life experience. In 1994, after the deaths of some very dear friends from AIDS, I went to India for the first of over ten visits. That’s when my perceptions dramatically shifted. I became very involved with Tibetan Buddhism, as well as a tradition-based yoga practice (a cross between Iyengar and Hatha). I also became interested in Hindu-based wishing trees, which inspired The Wish Machine, an interactive, multi-sensory public art project initially installed in Grand Central Terminal in 1997 before traveling worldwide. It was a vending machine, covered with a photomural of an original wishing tree in India, that dispensed a photo-collage of a plant and vial of the plant’s essential oil. The act of wishing often accompanies a desire for change, and is universally indicative of hope for the future. Humans process change into hope, then into healing. SW: How did your feminism fires get fanned in India? CS: On my first trip south, to Mahabalipuram in 1995, I became interested in women doing Pongal Kolams, intricate chalk drawings in front of doorways. In 1999 I met Jetsunma Tenzin Palmo, a Buddhist nun who was dedicated to reclaiming the lost traditions of Tibetan woman spiritual practitioners of her lineage, after the Cultural Revolution. I volunteered to help, but not for just one-month. I developed a much deeper commitment which spanned years, supporting her by forming Dongyu Gatsal Ling Initiatives, a non-profit to provide self-sufficiency and independence for female spiritual advancement in the Tibetan Buddhist tradition. This in turn led to MOMMY, a collaboration with artist Susan Silas and a celebration of contemporary women artists, reclaiming creative stories and output which might otherwise get lost. SW: How else has India inspired you? CS: There was a blossoming of the Indian art scene in the mid 1990s, as well as the natural spiritual backdrop that was omnipresent. I mounted exhibitions, public art projects, made friends with artists and yogis. Not only was all this inspiring, it gave me another community to be fully engaged with, still empowering the feminine. SW: I find your mixture of spiritual and traditional creative outlets with technology intriguing, along with your spaces for reflection in very public places. Tell me more about your views on the idea of imprint and change. CS: I have always been fascinated by how we leave imprints in an impermanent world. The philosophy that stems from the meaning of an imprint is magical yet scientific at the same time. Yoga is a perfect example of constant change within the body, the breath, and the practice. The rose mandala is also based on that impermanence. SW: What will people experience this Valentine’s Day when they attend your installation performance? CS: Over the course of several hours during the day beginning at 3PM I will slowly peel and place the petals down, one by one circling the mirror, expanding outward and extending the dimension. The fragrant sensory experience will yield to time; they will dry and eventually be blown or swept away. People will be welcome to come sit by it on a meditation bench, and look in the mirror at the center. Normally the mirror would be recycled, but in this mandala I use the same mirror that His Holiness the Dalai Lama placed a rose on in its first incarnation. This all sounds like the perfect spiritual and sensual experience for anyone on Valentine’s Day, especially sweethearts. Where but in the world of romantic love is impermanence so lamented and yet so practiced? With a rose mandala, it is celebrated with artistry, wisdom and joy.